Even the regular Roman soldier was a well-equipped and well-trained warrior. 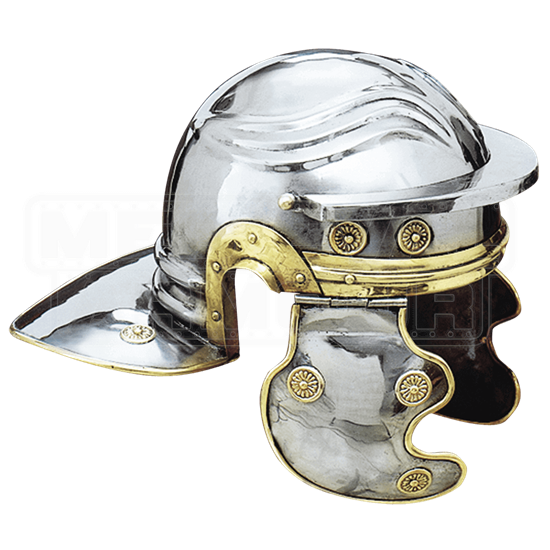 They were armed and armored, with most even wearing the Roman Trooper Helmet in order to provide the best protection possible on the field of battle. This helmet has the original look and feel of a classic Roman helmet, featuring a rounded cap with a visor, as well as a protective tail in the rear, located at the base of the neck. The forehead of the helmet features a protective rim, while the sides of the helmet features hinged flap protection, designed to cover and protect the face. The helmet is made from 18 gauge polished carbon steel and features attractive brass accents, including circular accents located on the flap protectors and along the forehead rim of the helmet. Brass also accents the rim of the helmets forehead and open ears. This classic Roman Trooper Helmet was designed with the utmost efficiency in mind, protecting a troopers head without compromising his effectiveness.